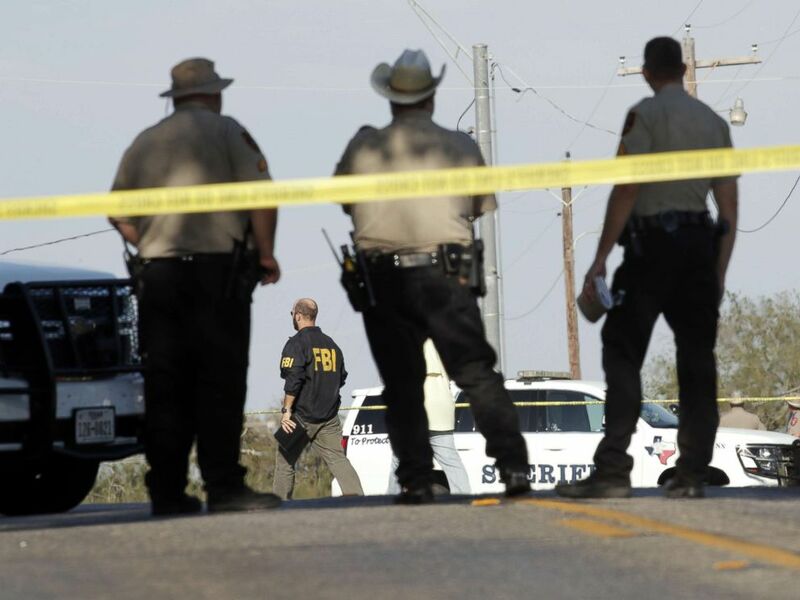 At least 26 people were killed and 20 others were injured when a gunman stormed a church in rural Texas with a rifle this morning, Wilson County Sheriff Joe Tackitt and the Texas Department of Public Safety said. Interested in Texas Church Shooting? 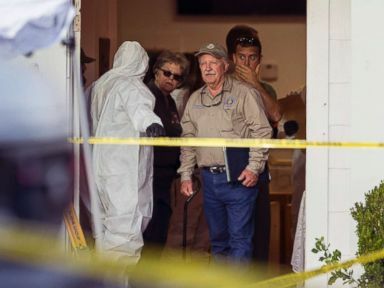 Add Texas Church Shooting as an interest to stay up to date on the latest Texas Church Shooting news, video, and analysis from ABC News. Victims' ages range from 5 to 72, authorities said. Texas Gov. Greg Abbott called today's shooting in Sutherland Springs, about 40 miles southeast of San Antonio, the largest mass shooting in Texas history. Investigators work at the scene of a mass shooting at the First Baptist Church in Sutherland Springs, Texas, Nov. 5, 2017. The alleged shooter, a 26-year-old man, is also dead after the massacre at First Baptist Church, bringing the total number of fatalities to 27, authorities said. Law enforcement officials gather near the First Baptist Church following a shooting on Nov. 5, 2017 in Sutherland Springs, Texas. The attack began at about 11:20 a.m., after a suspect was seen at a Valero gas station in Sutherland Springs, dressed in all black, the Department of Public Safety said. The suspect crossed the street to the church, got out of his vehicle and began firing at the church, authorities said. The suspect then moved to the right side of the church and continued to fire, before entering the church and shooting more, authorities said. As the suspect exited the church, a local resident grabbed his rifle and engaged the suspect, after which he dropped his assault-type rifle and fled, authorities said. A citizen pursued the suspect, authorities said. The suspect, who fled in a car, crashed and was later found dead in his vehicle in Guadalupe County, according to the sheriff and the Department of Public Safety. It's unclear whether he died from a self-inflicted gunshot wound or whether he was shot by another person, officials said at a news conference this afternoon at Stockdale City Hall, near the church. 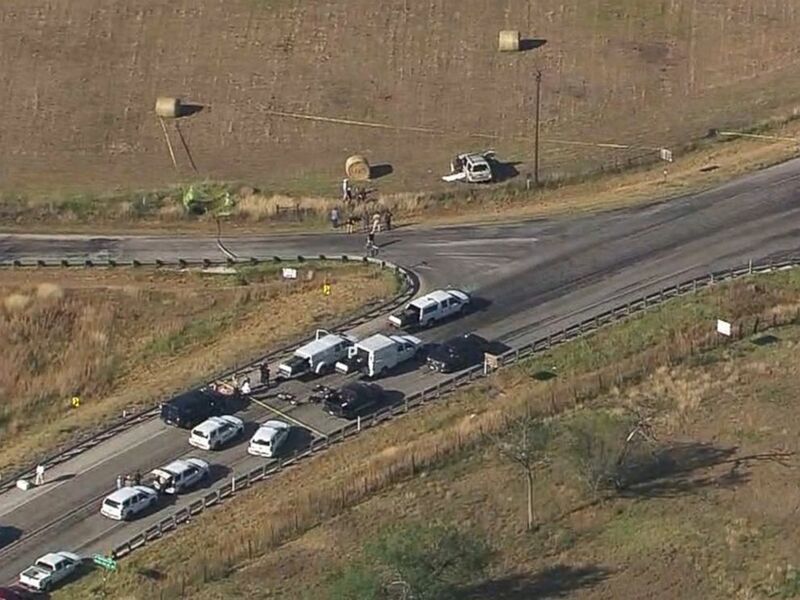 Police vehicles gather at the scene of the SUV where the suspected shooter who opened fire at First Baptist Church of Sutherland Springs, Texas, drove off the road and was found dead on Nov. 5, 2017. Multiple weapons were found in the vehicle, authorities said, adding that the suspect had tactical-type gear and was wearing a ballistic vest. The threat is believed to be over, Wilson County District Attorney Audrey Gossett said. Authorities did not discuss a motive at this afternoon's news conference. 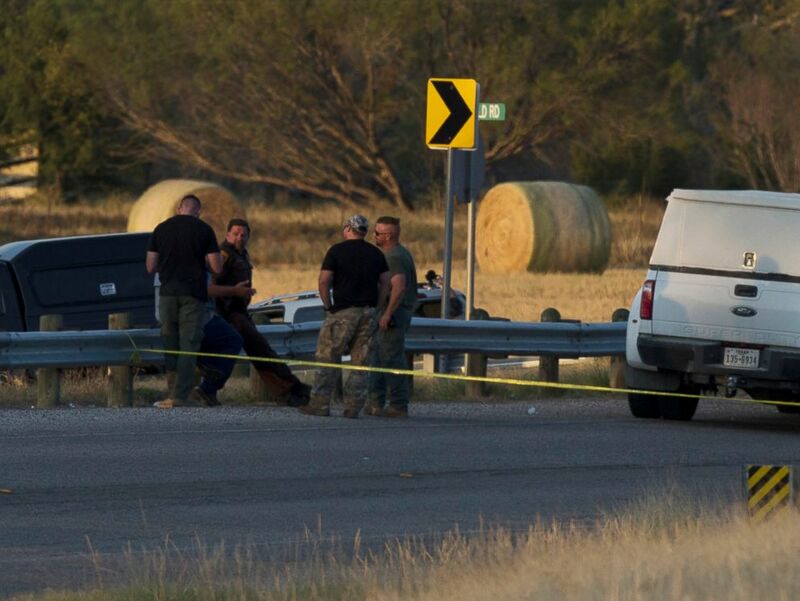 Authorities work the scene where the suspect of a deadly church shooting was found dead in his vehicle near the intersection of FM 539 and Sandy Elm Road in Guadalupe County, Texas, Nov. 5, 2017. Among those killed was a 14-year-old girl named Annabelle Renee Pomeroy, according to her father, Frank Pomeroy, who is a pastor at the church. Annabelle “was one very beautiful, special child,” Pomeroy told ABC News by phone. 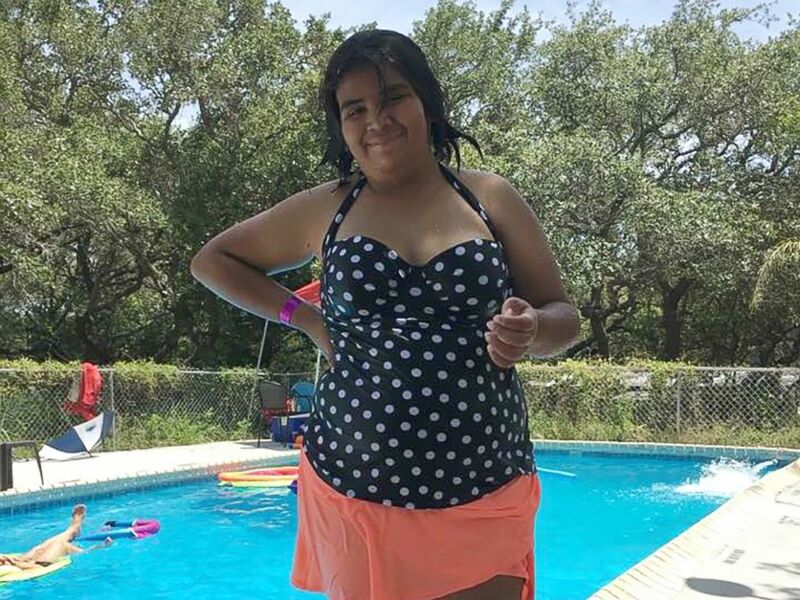 Annabelle Pomeroy, 14, was killed during a shooting at the First Baptist Church in Sutherland Springs, Texas, Sunday, Nov. 5, 2017. Her father, Frank Pmeroy is the pastor, but was not there at the time of the shooting. Pomeroy said he was in Oklahoma this morning, a rare weekend that he wasn't at the church. The other victims are all close friends of his, he said. Last Sunday, Pomeroy delivered a sermon at the church, encouraging parishioners to "lean on the Lord," even when circumstances don't make sense. "Trust in the Lord with all your heart and do not rely, or lean, on your own understanding," he said. "You see God's understanding is far greater and there may be things that are taking place that you don't understand but you still need to do what God's calling you to do." 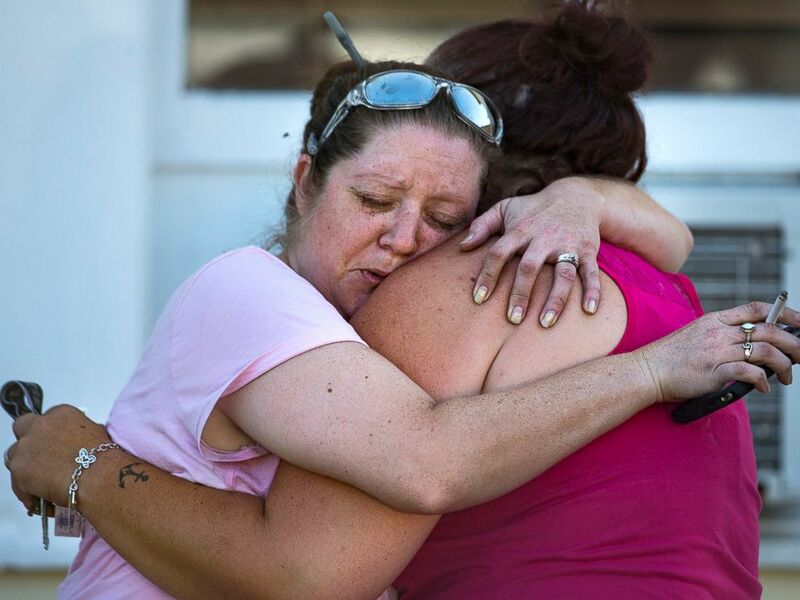 Carrie Matula embraces a woman after a fatal shooting at the First Baptist Church in Sutherland Springs, Texas, Nov. 5, 2017. A woman who said she works at a gas station across the street from the church told ABC News she heard rapid gunfire around 11:15 a.m.
Congregants fled the church and ran to the station cowering for cover, she said. 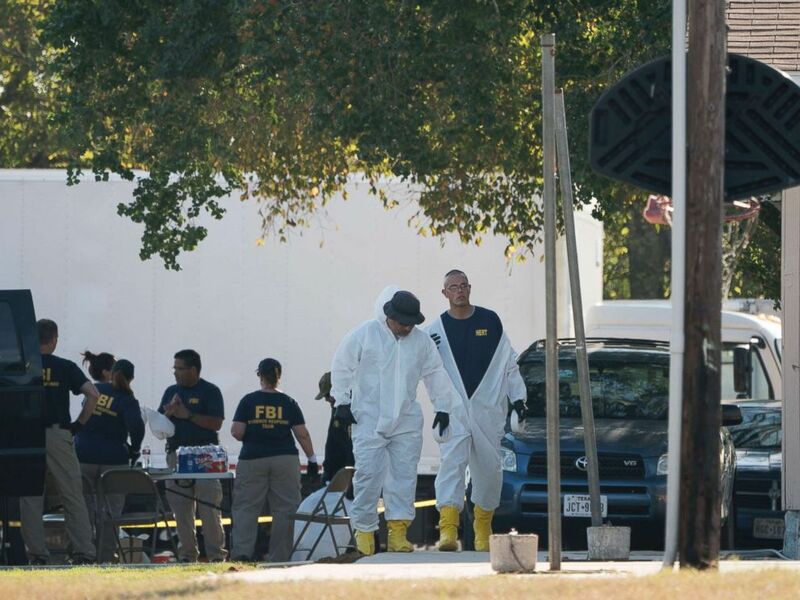 Members of the FBI walk behind the First Baptist Church of Sutherland Springs after a fatal shooting, Nov. 5, 2017, in Sutherland Springs, Texas. “We heard several shots and we all started running inside the store,” said the woman, 49, though but declined to give her name. Within minutes of the gunfire, emergency personnel arrived at the scene, she said. Police formed a perimeter around the First Baptist Church and flooded its grounds with emergency and police vehicles, according to ABC San Antonio affiliate KSAT-TV. Agents from the FBI and the federal Bureau of Alcohol, Tobacco, Firearms and Explosives have responded to the scene. Sutherland Springs, Texas, was the scene of a church shooting, Nov. 5, 2017. 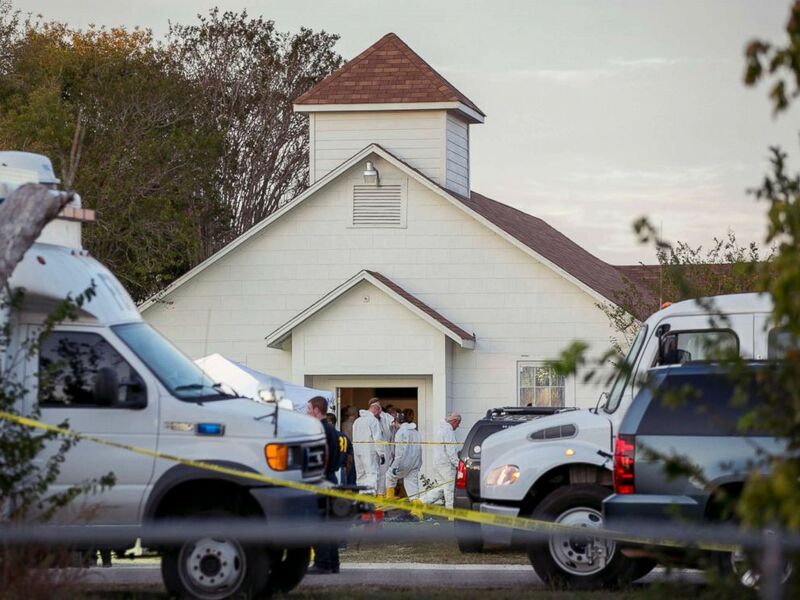 A small group of people were seen clustered together outside the small, white church, holding hands and attempting to pray, a KSAT reporter said. Paul Buford, a pastor at another church in Sutherland Springs, told KSAT his congregation was in the middle of their service at River Oaks Church when they started getting calls about the shooting. Members of his church who are first responders rushed out while the rest of the congregation immediately started praying. 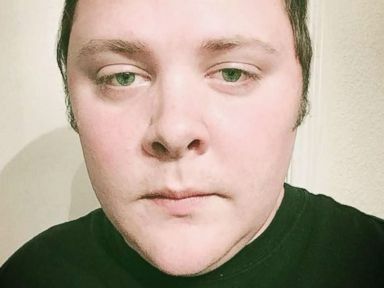 The shooter was identified as Devin Kelley, 26, of New Braunfels, Texas, which is about 35 miles from Sutherland Springs, federal and state law enforcement sources told ABC News. Devin Kelley, 26, identified as the suspected shooter who opened fire in the First Baptist Church of Sutherland Springs, Texas, is pictured in an undated Facebook photo. The investigation into his background is unfolding. The suspect’s Facebook profile appeared to show a picture of an AR-15–style gun. The U.S. Air Force confirmed Kelley served from 2010 until his discharge, which the Department of Defense's service verification website reports was in 2014. Ann Stefanek, an Air Force spokeswoman, said records confirmed Kelley served in the logistics readiness department at Holloman Air Force Base in New Mexico. President Donald Trump, who is in Japan, began his remarks to business leaders in Tokyo by addressing the shooting as "an act of evil" in a "place of sacred worship." "Together we join hands we lock arms and through the tears and through the sadness we stand strong," Trump said. He tweeted earlier, "May God be w/ the people of Sutherland Springs, Texas." Trump has been briefed “several times” and is continuing to receive regular updates, White House Press Secretary Sarah Sanders said. "This will be a long, suffering mourning for those in pain," Abbott said at this afternoon’s news conference. “We ask for God's comfort, for God's guidance and for God's healing for all those who are suffering. Abbott said earlier in a statement, "Cecilia and I want to send our sincerest thoughts and prayers to all those who have been affected by this evil act. I want to thank law enforcement for their response and ask that all Texans pray for the Sutherland Springs community during this time of mourning and loss." 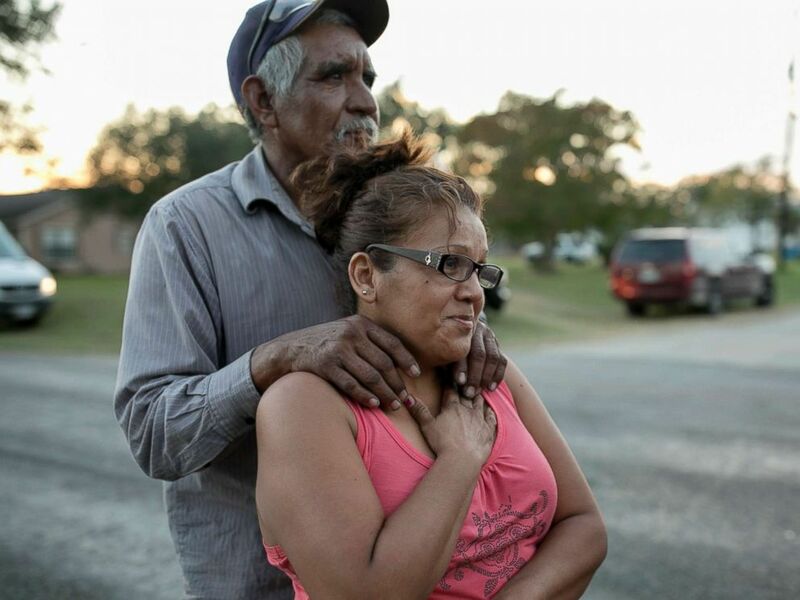 Enrique and Gabby Garcia watch investigators at the scene of a mass shooting at the First Baptist Church in Sutherland Springs, Texas, Nov. 5, 2017. 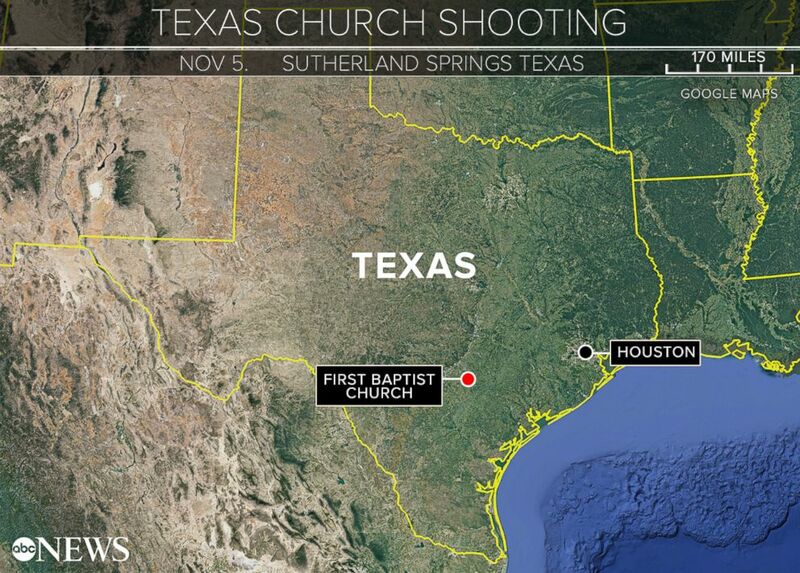 Texas Attorney General Ken Paxton said in a statement, "The thoughts and prayers of all Texans are with the people of Sutherland Springs as tragic reports come out of First Baptist Church." "Please join Angela and me as we pray for those impacted by this horrific shooting,” Paxton said. The massacre in Texas is at least the third deadly shooting at a U.S. church in the past three years. In June 2015, white supremacist Dylann Roof shot and killed nine black churchgoers during a Bible study at the Emanuel AME Church in Charleston, South Carolina. Roof was sentenced to death this January. In September 2017, a gunman allegedly stormed the Burnette Chapel Church of Christ in Antioch, Tennessee, fatally shooting a woman in the parking lot before entering the church sanctuary, shooting and wounding six people. ABC News' Jack Date, Pierre Thomas, Mike Levine, Aaron Katersky, Meghan Keneally, Michael DelMoro, Katherine Faulders and Joi-Marie McKenzie contributed to this report.